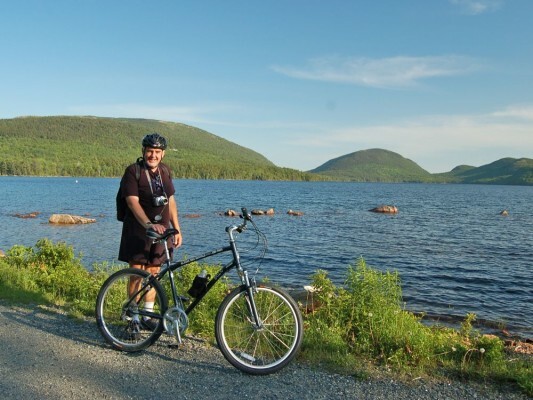 Friday was a nice sunny day, so after some “getting ready for Murder Mystery Dinner on Saturday” chores in the morning, Steve, Don, Lisa and I set out to rent some bicycles and then ride them around some of the carriage roads in Acadia National Park on Friday afternoon. We picked up the bikes and loaded them into Steve’s Honda Ridgeline truck for the ride out to a car park at the north end of Eagle Lake. From there we set out south along Eagle Lake, and then Jordan Pond to Jordan Pond House for Popovers, then back north on different roads to the east side of Eagle Lake, and back to the car park. Roger poses beside the bicycle with Eagle Lake in the background.